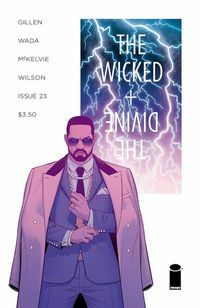 The team behind critically acclaimed Young Avengers and Phonogram have taken us on a hell of a ride for the past two years in The Wicked and The Divine, and the series just keeps getting better. We were able to get our hands on a copy of the WicDiv #23, and I’m here to give you the skinny on the issue and lay out the case for why this is the best series on the shelves. The Wicked and The Divine #23 is unique in that it is set up not as a traditional comic, but a one-off issue that reads as an issue of “Pantheon Monthly,” a magazine that has exclusive interviews with some of the series’ principal characters. I couldn’t think of a better case study to attest to Gillen’s talents as a writer. I’ve been a fan of The Wicked and The Divine from day one, but this issue has really amplified my love of the series. I was reminded of Marvel’s Front Line series of the past decade in that this issue gives us a different perspective of characters like The Morrigan, Baal, Amaterasu, Lucifer, and Woden. I like that the team is experimenting with these one-off issues because they make the reading experience unique. It’s clear that Gillen has put in a lot of effort in charting a course for the series and its characters. With a principal cast of 12 gods and several supporting characters, there’s a lot going on in this series, which has been why WicDiv has been at the top of my reading list for the past two years. We’re learning more about the characters each month, and The Wicked and The Divine #23 is no exception. One thing that’s struck me for awhile is that the series features one of the most diverse set of characters we’ve seen for awhile. This isn’t a reboot series where a woman or person of color steps into the titular character’s role–LGBTQ and people of color have been represented from the get-go. It’s refreshing that the WicDiv team is actively trying to create a story for everyone. Writing is only one part of the equation. With comics being a visual storytelling medium, I would argue that art is even more integral to a book’s success. To borrow a baseball term, Jamie McKelvie continues to knock the cover off of the ball–meaning that he isn’t hitting home runs, he’s hitting the art with such ferocity that you can’t help but fall in love in each panel. As Gillen has a firm grasp of where these characters’ stories are going, McKelvie’s character designs have been fleshed out. Each character has a unique style and attitude. That’s not to say that things are static–the art has continued to evolve with the characters as they have grown in the series, particularly in the case of Persephone. 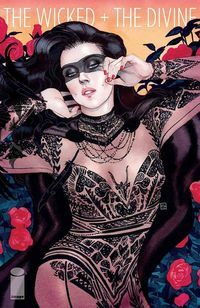 If you haven’t been reading along, I seriously suggest picking up the Wicked and Divine graphic novels so you can immerse yourself in this art. I’ve also been on board with Matthew Wilson’s colors from day one. Collaboration between artists and colorists (also artists, but differentiated as such for sake of clarity) happen every day. This kind of partnership, however, isn’t the norm–McKelvie’s linework and Wilson’s colors go together like fire and heat, milk and Oreos, or conjoined twins. They belong together. From the beginning, we’ve known the score: within two years’ time, these characters will die. The premise almost dares you not to read the series. The stakes are high and we never really know who’s going to go next. I was surprised at who was killed first as I really liked that character, which kind of makes Gillen the George R.R. Martin of comics. We’re always peeling away layers of these characters to find out more details of their motivations, past lives, or the story’s bigger picture. WicDiv represents a type of storytelling that is much more than punch this foe, foil that bad guy’s master plan. The other thing that really resonates with me is the idea that The Wicked and The Divine expertly deals with themes of fandom, devotion, and religion–these are, after all, gods. Some people love them, others loathe them. It was really fun to read the “interview” with Woden because he is in the latter camp. He’s a racist mysogonist with an inferiority complex. I dig the “god” angle of the series a lot. Like I said before, this is a bold series with a complex set of characters who are brash, powerful, and coming to terms with their fates. Each issue of The Wicked and The Divine is an opportunity for Gillen and McKelvie to yank the rug out from under us. This has happened several times so far, and WicDiv #23 provides a little perspective on the fallout of those moments. The team is willing to take this book and its characters to a place where other books from the big two wouldn’t be able to tackle, an that makes this one of the best books on the shelves today. Have you been reading WicDiv from the beginning? What’s your favorite moment from the series so far? Are you thinking of trying out for the series for the first time? Join the conversation below. Enter to Win All 52 DCU Relaunch Issues!